This is a face that few will recognize. Even over a century ago his face was not well known. Despite this, most people who own any recordings dating from 1897 to 1904 have indeed heard him. It seems ironic that someone we can hear on hundreds, perhaps thousands, of records was decidedly never known for his recordings. In 1897, an authentic Indiana Hoosier set foot in the Columbia Phonograph company lab to replace the first studio musician ever, Edward Issler. This young man’s name was Fred Hylands, a 25 year old ragtime pianist fresh out of the vice ridden midway of Chicago. Around the end of the previous year, the management at the Columbia Phonograph Company set up their first laboratory in Manhattan, and with this new headquarters, they needed some new talent. Among the new workers they hired, they weeded through dozens of pianists to eventually choose the somehow charming and eccentric Hylands. He was showcased as their token “rag time” pianist from the very beginning of his employment at Columbia, being specifically advertised as thus in trade magazines such as The Phonoscope. 1898 is the year that we can truly begin to hear the genius and authentic syncopation of Mr. Hylands’ accompaniments. Pretty much every Columbia record from this year and the next includes his piano accompaniment. And luckily for those of us hoping to study his distinct piano style, records from this particular period of time are not nearly as scarce as they might be. Hundreds of examples are free for access online and in university archives. If you are looking to study his accompaniments on old 78s that many may have stashed in their attics, the best period of time to look for his accompaniments are on Berliner records from 1899 and 1900, and Columbia records from 1900 to 1904. It is not yet known when Columbia dropped him from their salary rolls, as it is barely known exactly when he started. Mr. Hylands proved a difficult asset for Columbia’s staff after 1901 when more reliable studio pianists began creeping their way into the old Manhattan lab. Hylands was notoriously untrustworthy in the studio, and he was often poked fun at by his fellows in trade magazine gossip. In many ways, he was a Tom Turpin-like figure, at least in the physical sense, a freakishly tall man whose weight often fluctuated quite dramatically and demeanor was often unpredictable. He earned an unsavory reputation from these traits. The mocking articles poking fun at him seemed to bleed over into his career in vaudeville, both during and after his time in the Columbia lab. 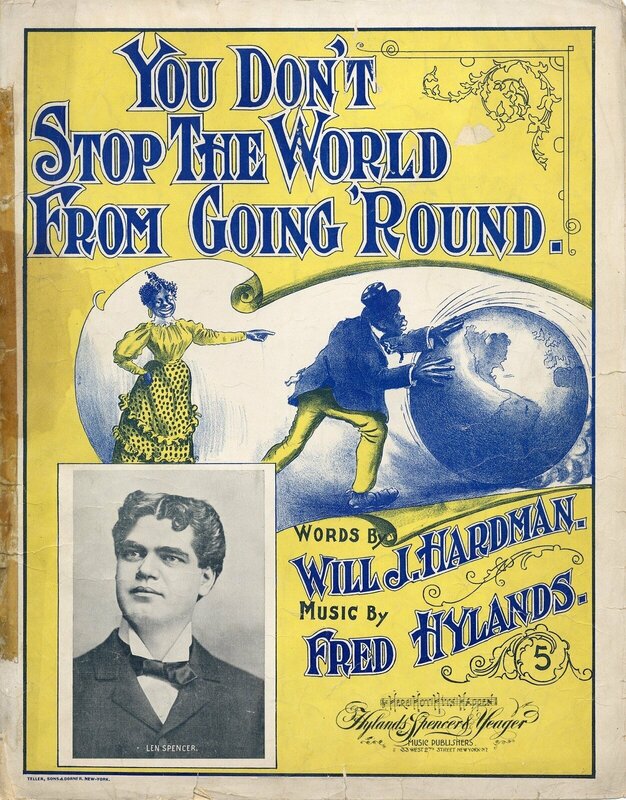 In 1902, Hylands began to fade from Columbia’s recording staff, as he was no longer their sole hot young ragtime pianist. A few serious patent battles in 1901 and 1902 led to a healthy cross pollination between phonograph companies, but this meant there would be less of that unique Indiana-Cincinnati rag style that distinguished Columbia’s records at that time. Occasionally he made his way back to the Columbia lab in 1904 and 1905, but these were rare occasions as at the time he was engaged working at the Majestic Theatre in Boston. It is possible that Columbia dropped him from their staff altogether because of his association with the White Rats Actors’ Union, as well as his frequent absences. Many Columbia records in the odd 3000 to 3050 series sporadically featured his accompaniments, even with the late date of early 1905. His biggest success, and certainly most his memorable, was perhaps his work on Broadway post-Columbia. In 1905, his musical The Beauty Doctor premiered in a mildly successful two-week run on Broadway. The success of this show was enough to get him and his company touring all over the midwestern United States and the south until 1909. By 1910, he returned to New York, but his life had taken a downturn. In 1908, Fred’s father died, and from previous census records, it is evident that his father was a major source of support for Fred’s eccentric and ostentatious lifestyle. After his father’s death, his sister Etta (who was also a vaudeville performer) and his wife Marie were forced to support him financially. Between 1910 and 1912, Hylands teamed up with various performers in vaudeville, getting as much sporadic work as he could get to keep some kind of steady income. In 1912, for example, he teamed up with Nat Vincent, who went on to write dozens of standard tunes like “Dancing the Jelly Roll” and “I’m Forever Blowing Bubbles.” In 1913, during a tour in Britain with his final vaudeville partner and a small troupe, Hylands dropped dead, cutting the tour short. It is unknown to this day where he was buried, and even if he was at all. Perhaps the strangest thing about Mr. Hylands is how his reputation lingered through awkward silence after his death. There was nothing said of him by anyone. In the 1930s and ’40s, recording researcher Jim Walsh interviewed several early recording stars (including Billy Murray) who certainly recorded with Hylands, but none of them even bothered to mention his name. His old vaudeville partner Nat Vincent was interviewed by ASCAP decades after the Tin Pan Alley era, and when recalling his life in great detail never mentioned Hylands either. It remains unknown why everyone refused to remember him, in spite of his obvious presence in the Columbia phonograph studio and in the vaudeville row in old New York. But why should ragtime era scholars bother to listen to his accompaniments? In terms of his distinct regional style, it is the most unique of all the dozen studio pianists that lived and worked in the piano accompaniment era (1888-1905). Hylands’ style is the most textured and representative of what the earliest forms of ragtime really sounded like. Even piano rolls cannot replicate the amount of character and personality that Hylands’ records can—if you can get past the singers and performers, that is. R. S. Baker has appeared at several Ragtime festivals as a pianist and lecturer. Her particular interest lies in the brown wax cylinder era of the recording industry, and in the study of the earliest studio pianists, such as Fred Hylands, Frank P. Banta, and Frederick W. Hager. Visit her website at theoldrecordgal.blogspot.com.